Having received an outstanding musical and strong academic education, most Purcell students go on to be successful in their chosen fields. We take great care in nurturing and offering guidance to ensure our leavers make informed choices about their futures and find the right place to continue their studies. In the main they graduate to study music at one of the top London music colleges, often having been offered scholarships. Destinations of leavers also comprise the UK’s top universities, including Oxford and Cambridge. 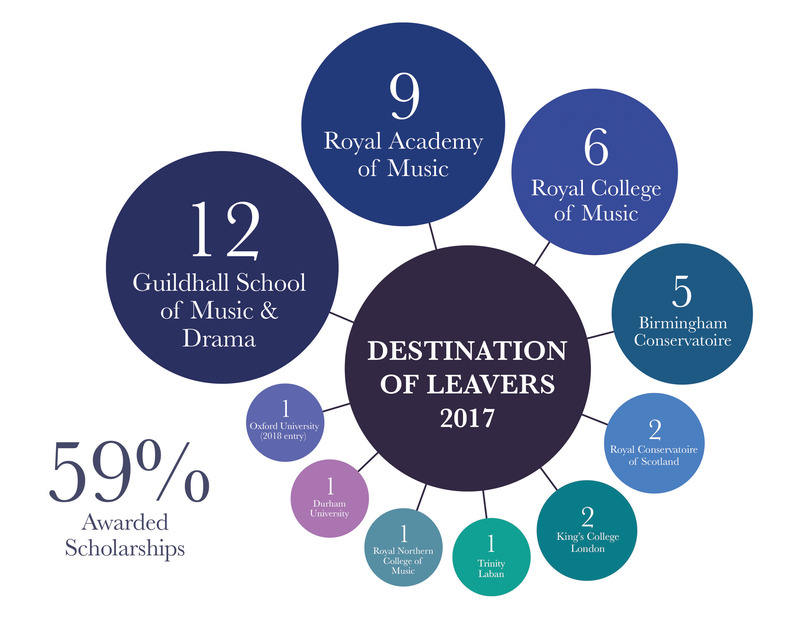 These routes are usually taken to study Music but each year a handful will follow other interests such as Physics, Aeronautical Engineering, English and History. We are very proud of our former students, many of whom have enjoyed national and international success. They can be found in the major orchestras of the UK and across the world, as well as in leading ensembles. Recent notable alumni include BBC Young Musician of the Year 2014 Martin James Bartlett, Royal Harpist Anne Denholm, twice Grammy winning Jazz pianist Jacob Collier and Oscar and BAFTA nominated film composer Mica Levi, to name but a few. Please note the numbers in brackets represent the scholarships won and taken up.